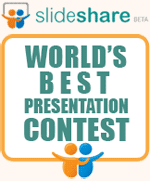 Slideshare is back with its annual global presentation contest. If you want to have fun, become famous and win exciting prizes this is your chance. Pick any topic you are passionate about (it can be about a trip, a hobby or about your work). Make a presentation about it (need not be very long). Be creative, design slides well and be interesting. I recommend you to consider participating. Here are other details you must know. 2. You can submit upto 10 entries. 3. To enter you need to have a slideshare account and you have to fill in all the personal details. 4. Slideshare users vote for your presentation and that's how you get shortlisted. Then the judges evaluate your presentation on its creativity, visual look and effectiveness. 5. Your presentation needs to be clubbed under one of the categories; Business, Education, Technology, NPO/Government, Creative/Offbeat & About Me. 6. You can win a MacBook, an iPad, iPod Touch & many iPod Shuffles along with a 3M PocketProjector. Read more about the contest by clicking here. Also watch the presentation which shares more details. To see what it takes to win this contest have a look at this presentation (which was the winner last year). I had analysed it on the blog even before it had won the contest. Click here to read the analysis. This time around there are two separate contests. The above contest is where you can make a presentation on any topic under the sun. The other contest is called 'Presentation Horror Story Contest'. Here you need to share a bad experience you had while making a presentation. 10 people have a chance to win 3M PocketProjectors. Read more about it here. What are you waiting for? Take out a few hours this weekend and upload your presentation on slideshare. Share it and become famous. This is your chance to showcase your talent to the world. Don't miss out. Even if you don't win, you will have enough to be happy about till the contest comes back next year.